This month celebrates the author’s 350th birthday and we chose Jonathan Swift’s mad trip, Gulliver’s Travels as our latest pocket guide to Irish literature. Jonathan Swift and Bram Stoker, author of Dracula, have one thing in common – most people don’t realise that they were Irish. As the author of Gulliver’s Travels, Swift’s travelogue is mostly known through the many film, book and television adaptations. Did you know that Gulliver’s Travels has a fair share of naughty humour and serious bits? It was not written for children. 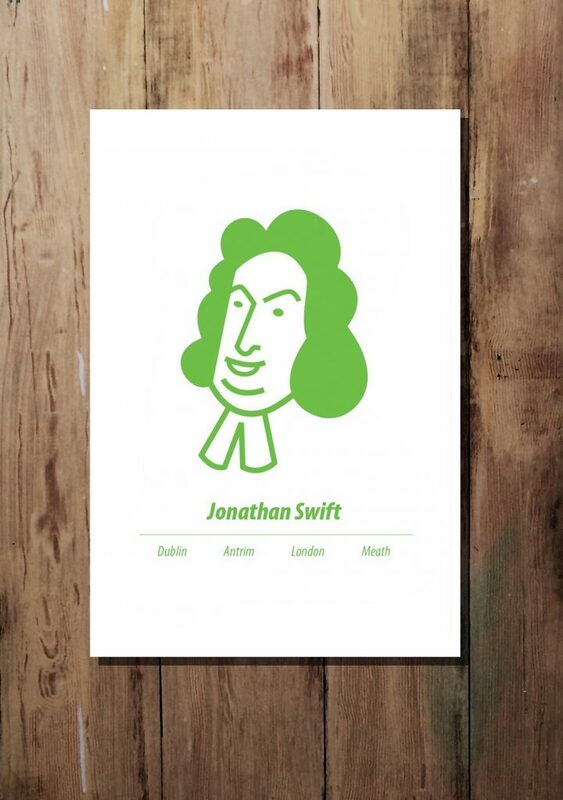 Jonathan Swift A3 print by At it Again! 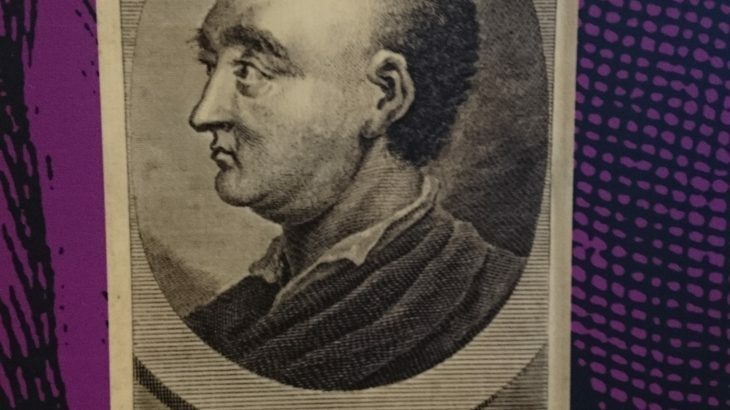 As most of the writers from our Romping through Irish Literature books, Swift spent part of his life in England, studying in Oxford and working and writing in London where his poison pen made him enemies in the political sphere. He was ordained as a priest of the Church of Ireland and had various parishes in Antrim and Meath before becoming Dean of St Patrick’s Cathedral in Dublin. When he moved back to Ireland, he used his poison pen for Irish causes. He continued writing up to his death including his own obituary and epitaph. You can visit his grave in St Patrick’s Cathedral. We love to discover little interesting titbits about the authors while researching our pocket guides. For example, did you know that Jonathan Swift invented the name “Vanessa” as a nickname for one of the key women in his life, Esther Vanhomrigh. Swift was a world-famous satirist who used satire to point out political and social issues of his day and inspired other writers like George Bernard Shaw and James Joyce. Although written 300 years ago, much of his work still feels relevant today with many of the issues that Swift exposed in his time still with us, e.g. housing conditions. His birthday will be celebrated by the Swift Festival from 23-26 November in Dublin with his actual birthday on the 30th November. Romping through Gulliver’s Travels by At it Again! “A most astonishing object, worthy to have the description of it transmitted for future ages” from Gulliver’s Travels by Jonathan Swift. Creating Romping through Gulliver’s Travels proved to be as challenging as doing our first title, Romping through Ulysses. Both original books are equally dense in content, themes and allusions to political and social developments of Swift’s time. Like many, we were only familiar with the children’s versions of the book. So, we were delighted to discover that the original Gulliver’s Travels has some naughty bits and was meant for an adult readership. No wonder James Joyce named Jonathan Swift’s work as one of his sources of inspiration! Romping through Gulliver’s Travels works as both an introduction or companion to the original work of literature and as an interactive city guide to Dublin. Find out the inside scoop on Jonathan Swift and Gulliver’s Travels, a rundown of the story, things to do and see, juicy titbits, best quotes and maps to explore the places that inspired him. Romping through Gulliver’s Travels was written by Jessica Peel-Yates, James Moore, Maite López-Schroeder and Niall Laverty and illustrated by James Moore. Published by At it Again! it is the 5th pocket guide in our Romping through Irish Literature series. Gulliver's Travels, Jonathan Swift Books, Christmas gifts, City guide, Dublin trip, Famous Irish Writers, gifts for booklovers, Gulliver's Travels, Irish Classics, Irish Literature, Irish Writers, Jonathan Swift, Jonathan Swift Festival, literary gifts, literary travel. permalink.